Do you have a Dad on your gift list this year that loves to hike or ride a bike? Or maybe garden or work outside? Then I have the perfect gift idea: JBL Clip 2! This Bluetooth speaker is compact, portable and waterproof. Just attach the JBL Clip 2 to a backpack or bicycle and enjoy hands-free entertainment for up to 8 hours. I LOVE to attach this Clip 2 wherever I am working - in the garden, on the dock fishing or wherever I need some music! The JBL Clip 2 is an ultra-light, ultra-rugged and ultra-powerful portable speaker. And never worry about weather because it is completely waterproof! 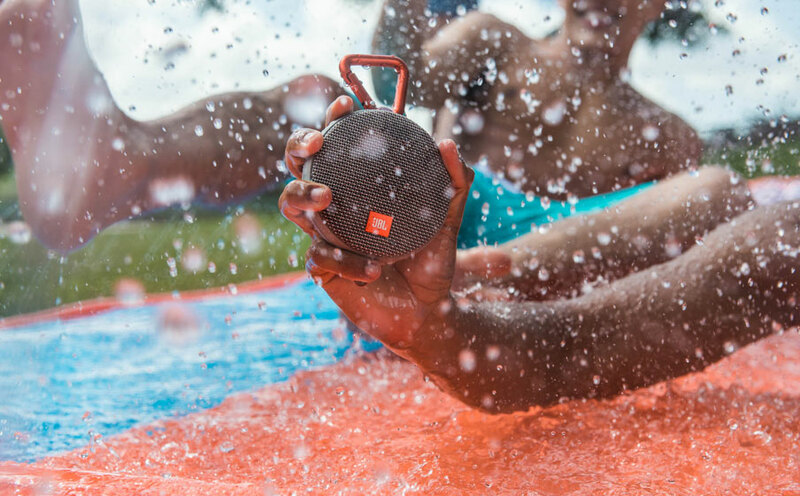 The JBL Clip 2 provides 8 hours of playtime, allowing you to take your music wherever you go, be it land or water. Stream music wirelessly via Bluetooth, or plug it into any smartphone or tablet with its attached audio cable. You can also wirelessly connect two Clip 2 speakers together to enjoy amplified sound. Use the speakerphone to make clear, noise and echo free phone calls. The JBL Clip 2 is covered with durable waterproof fabric, and earns its name with its upgraded carabiner, clipping to your clothes or backpack to take on any adventure. This is a great gift idea for any active, outdoorsy Father on your gift list this year! You can purchase JBL Clip 2 for $59.95 from the JBL website.